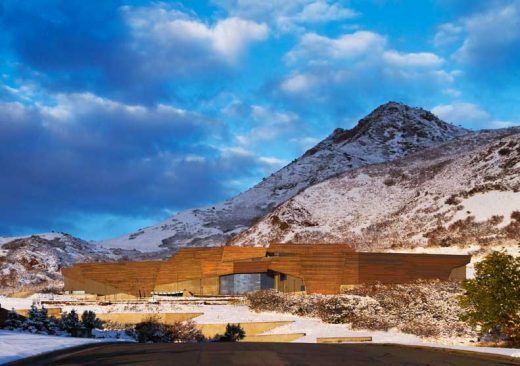 30 Nov 2011 – Designed by Todd Schliemann of Ennead Architects, the NHMU building sits on a breathtaking 17-acre site overlooking the Salt Lake Valley, its commanding profile and copper skin blending seamlessly into the foothills of the Wasatch Mountain Range. Partners Schliemann and Don Weinreich led the Ennead design team, in association with David Brems and John Branson of GSBS (Gillies Stransky Brems Smith) of Salt Lake City. November 18th 2011 marked the opening of the new Natural History Museum of Utah, the culmination of a week-long event for which thousands gathered in Salt Lake City. Located on the campus of the University of Utah, just a few miles east of downtown Salt Lake City, the Museum is positioned literally and figuratively at the threshold of nature and culture. Together with the interpretive exhibit program and landscape design, the architecture is intended to create an inspirational visitor experience and sponsor curiosity and inquiry. Todd Schliemann has designed a building that embodies the Museum’s mission to illuminate the natural world and the place of humans within it. The building provides a new home and much-needed space for the Museum’s extraordinary collection of artifacts, housing advanced research facilities in support of both undergraduate and graduate education at the University of Utah. “The natural scientists’ interpretive art makes natural history real to us. It breaks down the complex natural world into many parts and then reassembles it so we have the means to understand. In a similar way,” says Schliemann, “I have tried with my architecture to interpret the extraordinary landscape of Utah and how people engage it – both in the past and in the present.” Conceived as an abstract extension and transformation of the land, the Museum rests on a series of terraces that step up the hill and lay along the contours of the site with minimal disruption to the adjacent natural landscape. At its base, board-formed concrete marks the transition from the earth to the manmade. 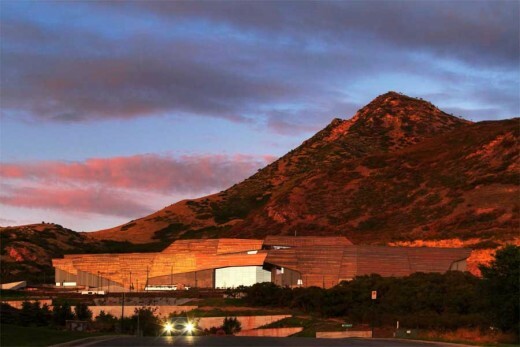 Constituting the skin of the building, 42,000 square feet of copper panels recall Utah’s geological and mineralogical history. Accent panels of copper-zinc alloy enhance the subtle variegation of the copper’s natural patina. “Before design began, I took a journey around the state of Utah. I call it my epiphany moment – one that unfolded over the course of a week. I saw an extraordinarily unique landscape – one that was timelessly natural, but also very architectural. At that time it became clear that the architecture should be of the landscape – belong to the landscape. I also saw how people had been engaging that land for millennia. 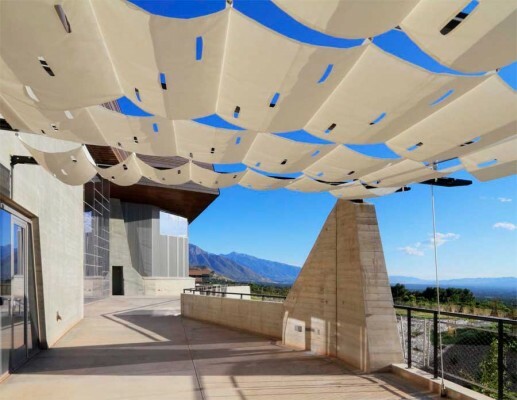 Therein lies the architectural inspiration behind the design – one that interprets the profound dialogue between culture and nature in Utah,” says Schliemann. Inside, the heart of the Museum is a voluminous, sixty-foot-high central public space – the Canyon – which divides the building programmatically into an empirical (north) wing and an interpretive (south) wing and provides access to both. Spaces in the north wing support formal scientific exploration and an objective understanding of our world: these include research laboratories, conservation labs, collection storage and administration. The south wing houses exhibits, whose narratives interpret the Museum’s extraordinary collections and guide the public through an exploration of the delicate balance of life on earth and its natural history. In the Canyon, bridges and vertical circulation organize the visitor sequence; views south across the basin expand the museumgoer experience; shafts of sunlight penetrate the apex, suffusing the space with natural light; and a grand vertical scale uplifts and inspires. Todd Schliemann of Ennead Architects on the design of the new Natural History Museum of Utah from Ennead Architects. The design for the new Natural History Museum of Utah embodies the Museum’s mission to illuminate the natural world through scientific inquiry, educational outreach, mutual cultural experience and human engagement of the present, past and future of the region and the world. Positioned literally and figuratively at the threshold of nature and culture, the building is a trailhead to the region and a trailhead to science. Utah’s singular landscape and the ways in which humans have engaged its varied character over time are the touchstone for an architecture that expresses the State’s cultural and natural contexts. Together with the interpretive exhibit program and landscape design, the architecture is intended to create an inspirational visitor experience and sponsor curiosity and inquiry. The building provides much-needed space to preserve, study and interpret the Museum’s extraordinary collection of artifacts, and its exhibits explore and articulate natural history and the delicate balance of life on earth. The building houses advanced research facilities, supporting both undergraduate and graduate education at the University of Utah. In the foothills of the Wasatch Range, the 17-acre site occupies a prominent place at the edge of the City and the University of Utah campus. Located on the high “bench” that marks the shoreline of the prehistoric pluvial Lake Bonneville that covered much of the Great Basin, the site offers breathtaking views of the Great Salt Lake, the Oquirrhs mountain range, Kennecott copper mines, Mount Olympus and Salt Lake City. An extensive expedition across Utah in the summer of 2005 initiated the design process. This journey, whose goal was to investigate Utah’s identity as the starting point for the development of a unique and context-based architectural design in the service of science and discovery, featured visits to cherished natural sites and discussions with the State’s people. The influence of Utah’s cultural landscape, the specific impact of the site and environmental imperatives and the influence of the Museum’s institutional mission became the basis for the creation of a definitive architectural identity. The building is conceived as an abstract extension and transformation of the land: its formal and material qualities derive from the region’s natural landscape of rock, soil, minerals and vegetation. Further reinforcing the essential continuity of nature and human experience is the landscape design strategy, which, in blurring the distinction between natural vegetation and topography and intentional interventions, places humans at the nexus of environmental stewardship. The Museum rests on a series of terraces that step up the hill and lay along the contours of the site with minimal disruption to the adjacent natural landscape; its powerful jagged profile references the mountains beyond. Intended to play a seminal role in enhancing the public’s understanding of the earth’s resources and systems as well as be a model for responsible and environmentally sensitive development, the Museum is designed to achieve LEED Gold certification. A voluminous central public space – the Canyon – divides the building programmatically into an empirical (north) wing and an interpretive (south) wing and provides access to both. Spaces in the north wing support formal scientific exploration and an objective understanding of our world; these include research laboratories, conservation labs, collection storage and administration. The south wing houses exhibits, whose narratives interpret the Museum’s extraordinary collections and guide the public through an exploration of the delicate balance of life on earth and its natural history. In the Canyon, bridges and vertical circulation organize the visitor sequence; views south across the basin expand the museumgoer experience; shafts of sunlight penetrate the apex, suffusing the space with natural light; and a grand vertical scale uplifts and inspires. 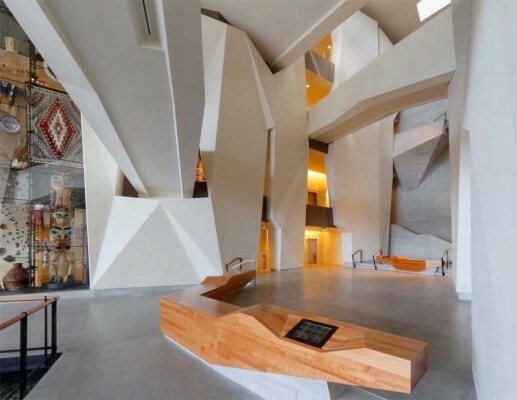 The material quality of the building’s exterior roots it in the landscape by recalling Utah’s geological and mineralogical history and expressing the design as natural form. At its base, board-formed concrete makes the transition from the earth to the manmade. Copper panels constitute the skin of the building, extending from the building’s volume at angles that reference the geophysical processes that created the metal. Accent panels of copper-zinc alloy enhance the subtle variegation of the copper’s natural patina. The standing seam copper façade is articulated in horizontal bands of various heights to emulate geological stratification on the building skin.